Life by the Creek: I had to do it. 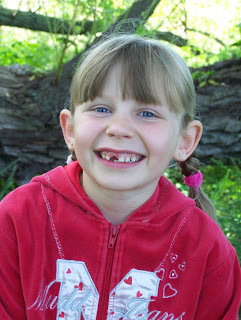 It was Rebekah's 7th birthday on the 11th! Happy Birthday to my Becky. While we were there, I saw this. 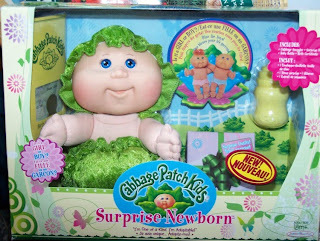 Totally still a cabbage patch baby. Love the pic of them lying together. Hannah looks like she's about to say something. LOVE THE PICTURES!!!! Hannah is so alert! 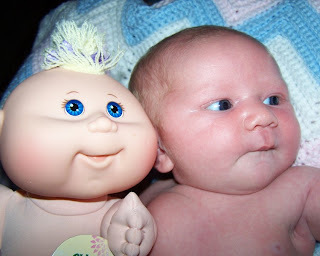 She looks to me as if she's really enjoying the resemblance. Now I can't wait to get a picture of Thumper and Ducky together. Adorable. So cute. Nice name, too, by the way. Awwhawwhaww! She looks so sweet! And she is definitely looking more and more like you every day. 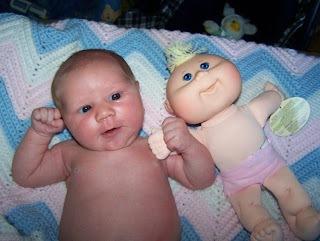 What a cute little dolly!